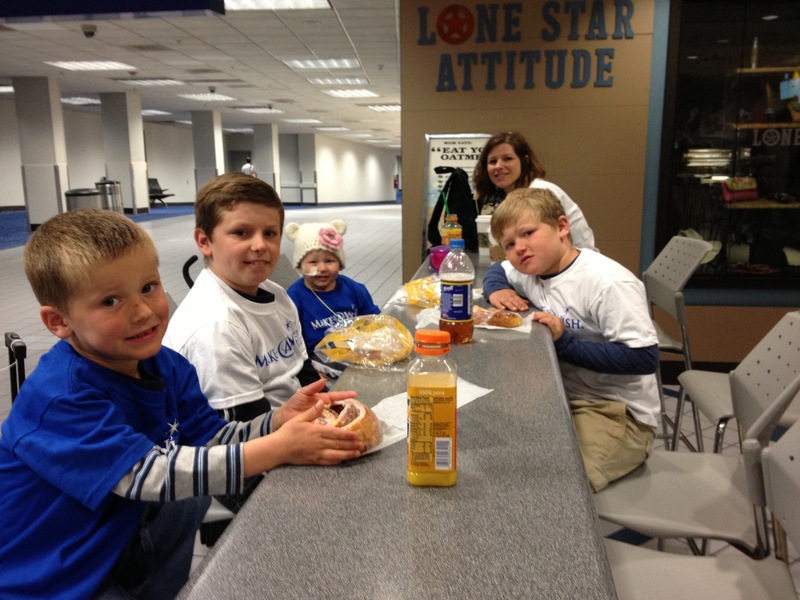 Our day started at 4am and we are off on our Make-A-Wish adventure to Colorado. Please disregard the post about Phoebe being in the hospital (if you receive e-mail notifications) we accidentaly posted an old-post. Thanks! Phoebe is slowly recovering from her 14 month battle. She’s doing great! And just like that she’s done! Phoebe is so full of life and energy and joy today. It’s beautiful. I know she doesn’t fully grasp what it means to be done with chemo, and I can’t tell her we won’t go to the hospital again, because we will. But not for a while, barring disaster! She has recovered and continues to recover from her LAST round of chemo. WOW. What a place to be. I admit, I do feel like I have some “road rash” for lack of a better way to explain the last year. I can look back over the past fourteen months now and see that in the beginning I was in shock. Phoebe’s brain surgery in my recall, is blurry and fuzzy and dreamlike. I remember feeling numb and going through the motions, but I was a little out of it in retrospect. The horror of the post surgery tremors and not sleeping for 36 hours; having to hold her arms down so she wouldn’t flail about. I feel like I am reading someone elses story when I scroll back the blog to those days. People reminded me to eat, told me when to rest, and even sent us away to a hotel to sleep for 16 hours straight that week after her surgery. Thank God for friends and family who stayed so close during those fragile days. And then the hairloss and the Septic shock and burned hands and feet. 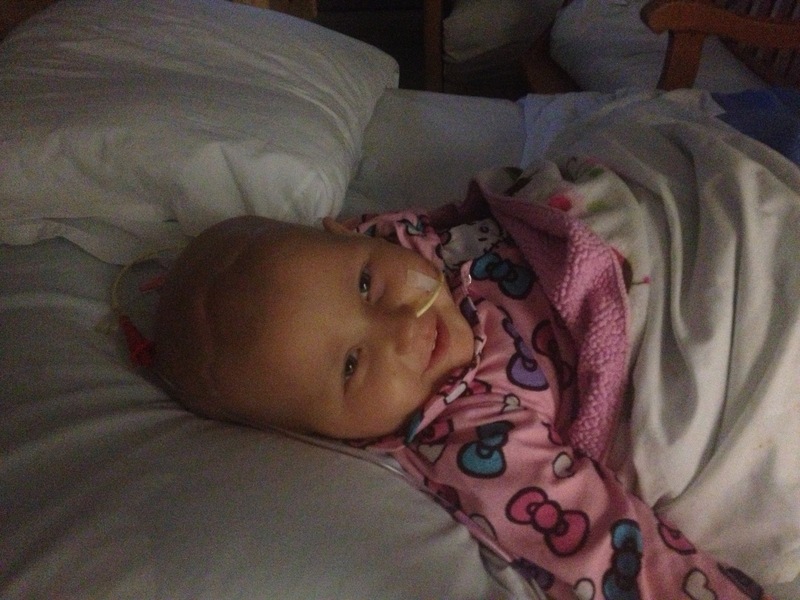 This sweet baby girl has been through so much. And we have gone with her on this crazy ride. All of us. All of you. Then things got better, chemo became more predictable, although not a schedule by any normal sense of the word. A thousand 2 am ER visits, and sodiums gone wild in either direction, and fevers and dehydration…and that was just Phoebe. We also had Deacon and the boiling pot of water incident the same day Ben broke out in mysterious hives, and we had 3 out of 4 of our children in the hospital at the same time. And of course who can forget the Whooping Cough the boys and I came down with? What a mess. And now we’re here. She’s done. Everything has changed in our world and we are different people because of this journey. It feels much like waking up from a stressful dream and realizing that your life is still in tact and you’ll be okay. But the memory is still there, and there are still things to process, still questions you are needing God to answer. So road rash…that’s the best way I know how to say it. Tomorrow morning we will wake up together, all six of us under the same roof and start the newest normal. And Phoebe will just be doing life with us, with her blood counts climbing and climbing and that feels amazing. We have learned to live in the moment with this sweet girl, and we are all going to enjoy having her around all the time. The boys are doing great; some of you have asked about them. Benjamin is enjoying Cub Scouts and spending time with friends playing in our bamboo forest, making hide-outs and cutting down trees with his machete. He is a voracious reader and if I don’t hear him for a while, I can usually find him curled up somewhere with a book. He is an awesome helper with Phoebe and Deacon and has really bloomed since we moved back to East Texas. Averic is doing great too. He is hoping to start Gymnastics or Karate soon and has been improving in his reading which has been a struggle for him at times. We recently adopted a new dog that we named “Howdy” and Averic being the animal lover of the family, loves running around with Sadie and Howdy on our land. Averic is a big snuggle bug when it comes to Phoebe and she asks for him most often. He enjoys going to home-school roller-skate day each Friday at a church nearby and loves spending time with his friends. All 3 boys are also involved in kids choir at church on Wednesday nights and they love it. Deacon is doing well, although I think this year has affected him the most. He lost his play-mate for a long time; she changed, she was different, she couldn’t play or run or wrestle like they used to and that was tough for him. He often has a difficult time understanding why Phoebe is “so special that everyone sends her mail and presents and not me” Poor little guy. How do you explain it all to a new 5 year old? So, he is a bit clingy with me and at times a little more sensitive than your average kid, but I am hoping and praying that he begins to feel more secure about his place in the family soon. He sneaks into my bed around 2 am every morning and I let him stay. He hasn’t had nearly the amount of attention and focus this past year that he would have otherwise, and I feel those 2 am snuggles, at least in part, make up for some of that. He enjoys learning letters with Mom and “doing art” he says. He is so glad to have Phoebe home and it is the joy of my heart to see those two together playing in the bathtub or playing make-believe. Nathan and I are looking forward to getting away together, just the two of us very soon. We have passed like ships in the night too oft these past many months and we need to get to know each other again. I have gained so much respect for my husband through all of this. He has laid down his life for his family and remained strong throughout it all. He has anchored us and been the best Dad a little girl could ask for. I am so proud to call him mine. So here we go…and I know God goes with us into this new place. He has carried us and will continue to carry us. Phoebe is on the upswing. 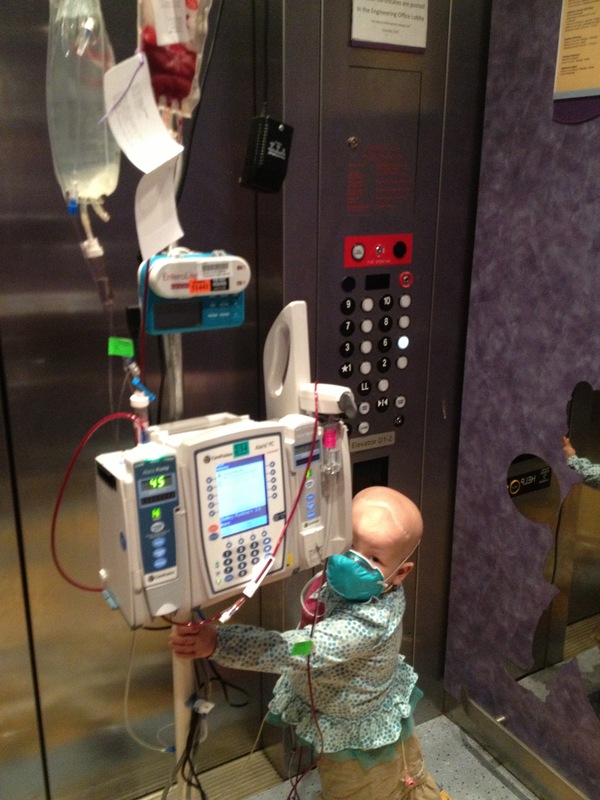 Right after she received her platelets and blood transfusion yesterday, Nathan sent me a picture of her walking to the playroom! The difference in how she feels pre vs. post transfusions is really incredible. Blood is so important, and having the right amount of the right things in your blood makes you able to function properly. The best news is that her ANC (Advanced Neutraphil Count) is 30 today, which means that her immune system is revving up again and she could be headed home as early as tomorrow. It’s wonderful to think this might be her last transfusion for a very long time, and that soon enough we can take her all around town and to church without worrying about her immune system! What a feeling that will be, to just be able to go places with our whole family intact. Eventually we will work towards weaning her off her ng tube, giving all of her meds orally, and teaching her that she has to drink despite her lack of thirst. We will also be setting up a set-caloric intake to help balance out her weight. There are still many challenges ahead, but having been through the last fourteen months, they seem minimal in comparison to chemotherapy and learning to swallow, breathe and walk again after sepsis. We can do it! She can do it! We have so much to be thankful for. Here’s to Phoebe coming home to stay! Phoebe is having a hard time with this round of chemo. 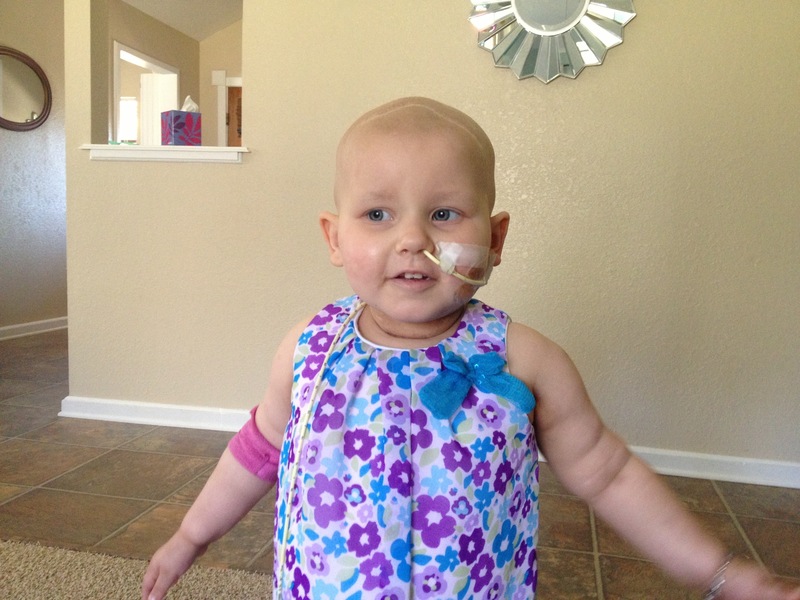 Her hemoglobin and platelet levels are lower than they have ever been before. She just received a platelet transfusion and is now getting blood again. Her blood counts are still at zero. Please pray for her body to rally back from this tough round. Phoebe is feeling better today. 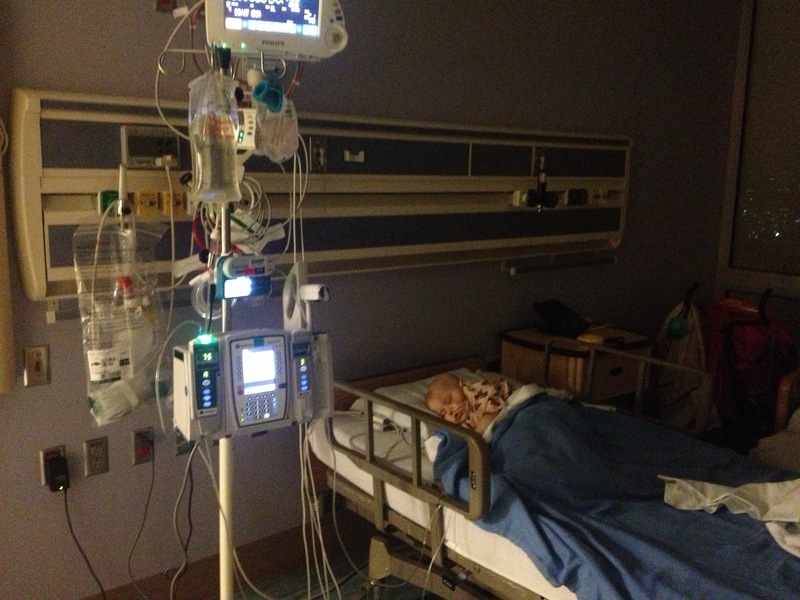 The fever has passed and she is receiving IV antibiotics. We are assuming she has a little virus as she has had some coughing and congestion lately. Her ANC is zero so they will keep her inpatient until her counts start coming up again. Thank you all for lifting up our girl.